Proverbs 31:10 27-28: A wife of noble character who can find? She is worth far more than rubies. 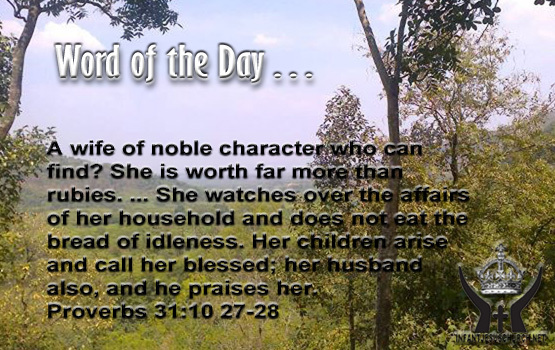 ... She watches over the affairs of her household and does not eat the bread of idleness. Her children arise and call her blessed; her husband also, and he praises her. Heavenly Father, we want to thank you for the women of character and grace, gentleness and fire, love and obstinacy, who have helped shape our life, those who have helped us find, follow, and faithfully serve you. We especially thank you for our mothers and what she means to us. Please bless them all. We ask this in Infant Jesus' name. Amen. The representation of the vine was a rich one for the Jews since the land of Israel was covered with many vineyards. It had religious connotations to it as well. Isaiah portrays of the house of Israel as “the vineyard of the Lord”. Jeremiah describes that God had planted Israel “as his choice vine”. While the vine became a sign of Israel as a nation, it also was used in the scriptures as a sign of disintegration. Isaiah’s prediction spoke of Israel as a vineyard which “yielded wild grapes”. Jeremiah says that Israel will contain “degenerate and wild vine”. When Jesus calls himself the correct vine he makes clear that no one can assert their spiritual inheritance through association with a particular people or lineage. Rather, it is only through Jesus Christ that one can become attach into the true “vineyard of the Lord”.